Celtra, a global leader for rich media mobile ad serving and analytics, offers a flexible, easy-to-use platform that enables scalable rich media mobile advertising across native apps and the mobile Web on multiple device platforms. Celtra's groundbreaking Social Rich Media product enriches brands' social media conversation with immersive HTML5 rich media experiences delivered directly to social media mobile feeds. Advertisers can leverage the full capabilities of the award-winning Celtra AdCreator to produce enticing Social Rich Media ads, which can be published on Facebook and Twitter. Celtra AdCreator gives you flexibility to produce the right content without any template restrictions. Celtra SRM is aware of the devices your audience is using. Whether it's iOS, Android or desktop, it always makes sure to display the right content. Design for your specific marketing goal, using more than 30 plug-and-play components and over 150 easy-to-use ad features. With AdCreator Analytics, you are able to track more than 20 engagement metrics. Mobile rich media ads and social networks are a winning combination for consumer engagement. While both SRM and standard RM ads perform well across the board, social media networks have proved to be a more engaging environment, rendering much higher ad engagement rates and ad content consumption. 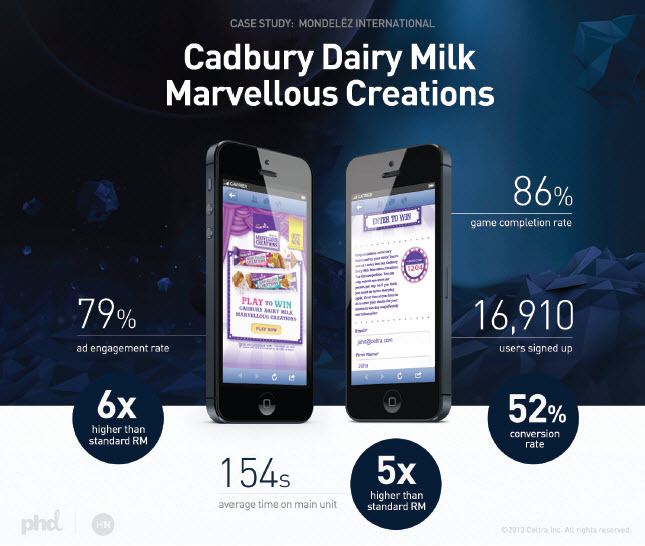 Inspire wonder, driving excitement and word of mouth about the latest Cadbury Dairy Milk product. Hold audience's attention for a significant amount of time, allowing them to experience the fun and "marvellousness" contained within each bar. Convert awareness to direct response by driving users all the way through the midfunnel to sign up for a prize competition. The campaign debuted in June 2013, targeting U.K. Facebook mobile users through promoted posts in their news feeds. When a user tapped on the post, a full-screen, device-agnostic Social Rich Media ad unit opened within the Facebook app and featured an engaging sweepstakes minigame. Social Rich Media provided the ideal platform to deliver an experience that allowed users to spend time playing a fun game, share their results and sign up to enter a prize competition. As seen in the image above, the campaign's outstanding performance at each stage of the funnel—from garnering interest and consideration to generating direct response—showcases the significant value Social Rich Media brings to mobile brand advertising.